Car key programmers that come to you! The Auto Locksmith offers a fast response mobile car key programming service with vehicle locksmiths covering the whole of London and the Home Counties. It just takes one phone call. Every van is fully equipped with all the latest machinery to repair and replace lost or broken car keys and our locksmiths have the specialist skills and equipment required for transponder key programming. We can get you back on the road in no time at all and it won’t cost you an arm and a leg! It doesn’t even have to be an emergency! In layman’s terms, a transponder key is a manufactured accessory that comes with a car and provides the radio transmission link between the car and the key. It means that a key can be programmed to start one specific, individual car thereby reducing opportunities for theft. Without its transponder key, a car can’t be driven. If you car keys have been stolen read our expert advice on securing your vehicle. Does every car have an immobiliser? In most modern cars the transponder chip is incorporated into the top of the car key. Since 1995 it has been a legal requirement for vehicles to be fitted with an immobiliser system for which a transponder key is required. It is in the form of a microchip that contains a serial number that the car manufacturer’s key programmer has made unique to that key. When inserted into the ignition, the key transmits an electronic request to the engine control units (ECU) and the immobiliser box, which then allow the car to start. If the car doesn’t recognize the serial number as the one it was programmed with, it won’t respond to the message and the car won’t start. The transponder key science bit sounds complicated but at least you know that this wireless, electronic communication between car and key only takes milliseconds yet its failure to operate can cause one expensive headache UNLESS…..you know how to contact The Auto Locksmith. You don’t need to go back to the dealer, have the car towed anywhere – in fact, you don’t have to worry. One phone call and you can put your mind at rest as The Auto Locksmith will come to you and take care of the rest. 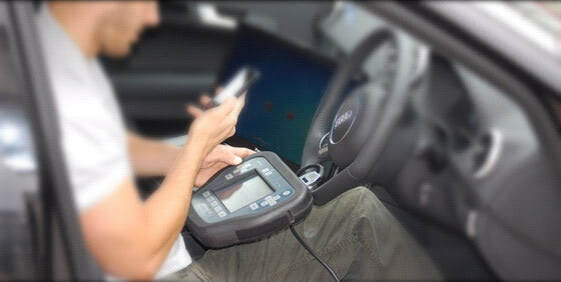 We offer car key programming for the majority of vehicles on the road and are often called upon by organisations like The AA, RAC and Green Flag to assist. If you are buying a car it will include a transponder key so you should ensure that you get at least two keys. Sometimes keys are lost, so having a second validly, programmed transponder key is important. If you buy a car second hand and it only comes with one key, it is recommended that you get a duplicate car key cut. All you have to do is call The Auto Locksmith and we will create a replacement key incorporating a transponder chip that is correctly coded to your car. No time required in having to find a garage– our vehicle locksmith expert comes to you. The technology involved in programming keys to specific cars has led many vehicle manufacturers and insurance companies to consider cars with transponder keys to be virtually theft-proof, but they’re not. If you know that your car keys have been stolen, make The Auto Locksmith your second call after the police. Even without having the actual key, The Auto Locksmith can erase the transponder serial numbers logged in your car, ensuring that the thief with your keys won’t be able to steal your car! We can then cut you a replacement car key and program them to your car to ensure a perfect communication between car and key. The Auto Locksmith phone numbers should be kept close to hand – take a moment and list 0800 158 3798 or 07739 383 344. I purchased a new remote locking key for my Vauxhall Astra through the local dealer. When I went in to collect the key they told me I would have to make an appointent to bring the car back for programming, although they were fully booked in the garage for a week. They suggested that if I was in a hurry I could have the coding done by The Auto Locksmith and kindly gave me their number. They were happy to match the Vauxhall garages price for programming my key and best of all they came to me, which saved me having to recover the car into the dealers garage. These guys offer a great service for programming car keys, well worth a call.